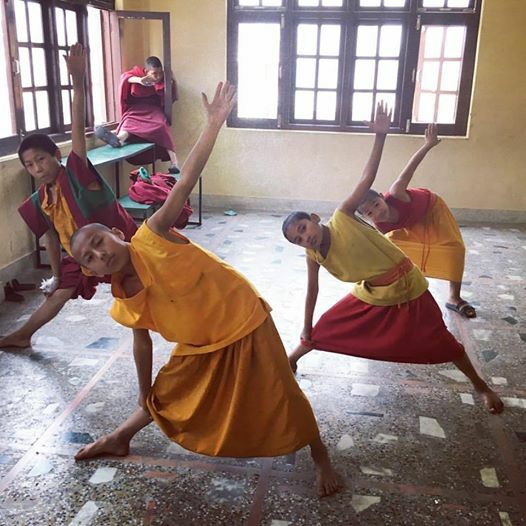 I just returned from Nepal where I stayed in the Tovo Kadhampa Monastery teaching yoga to the young monks. These children were so hard working and focused. Spending 4-6 hours a day chanting in Puja and the rest of the day in classes or doing chores, there was never a day off from this intense schedule. Though I was in the position of "teacher" I learned so much from them about Karma yoga, dedication, and patience. Stop thinking Right Now and you are Free. Lakshmi (Sanskrit:लक्ष्मी, lakṣmī, ˈləkʂmiː) is the Hindu goddess of wealth, fortune, and prosperity (both material and spiritual). In some representations, wealth either symbolically pours out from one of her hands or she simply holds a jar of money. This symbolism has a dual meaning: wealth manifested through Lakshmi means both material as well as spiritual wealth. Her face and open hands are in a mudra that signify compassion, giving, or charity. An unhappy and restless mind cannot concentrate. Make every possible effort to make your mind happy and peaceful. The standard of admission in Yoga is a peaceful and happy mind.